I admire Moneyball for telling a story of baseball and statistics without embellishing with a romantic subplot – unless you include the professional chemistry between Oakland A’s general manager, Billy Beane (Brad Pitt) and his number-crunching number two, Peter Brand (Jonah Hill). I also admire its ability to make that story engaging, with its confident approach defined by crisp cinematography and dialogue alike. 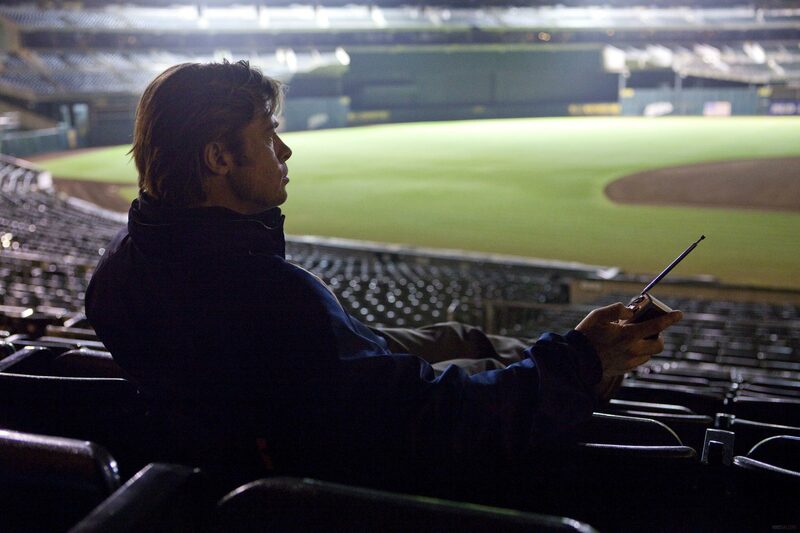 As much as I admire Moneyball, I didn’t actually like it all that much. Given that it’s firmly set in the hyper-masculine milieu of professional baseball, the lack of relevant female characters is disappointing yet forgivable. But that’s not what left me feeling underwhelmed; rather it was the philosophy the script espoused. Beane succeeds by ploughing ahead with a strategy in which he has unquestioned faith, neither acceding to a compromise in line with his colleague’s traditional methods (understandable) nor adequately justifying his methods (less understandable). Objections that would seem pertinent to a film called Moneyball – eg that a player’s worth is sometimes in his public image for marketing purposes, not winning games – are never raised. The film argues success comes from stubbornly insisting upon your way until it works. Accurate? Perhaps, but it left a sour taste. I dunno. Like, I agree that there was real chemistry there – that actress was fantastic! – but it felt so incidental to the storyline (it seems to only be there to explain why Beane didn’t take the $12.5m offer at the end), and I wouldn’t really call the daughter a “character” in any meaningful sense. I did like those scenes, though. Good review Dave. The sport of baseball has never quite interested (even though I somehow found myself playing it during seventh grade), but its movies always seem to make it so. Don’t know why that is. Yeah, it does seem to translate to film easily without having to necessarily rely on the same clichés every time. I’ve never played or watched a game of baseball (softball, teeball, I’ve played, if they count), but I was definitely fully engaged in the games in this film. They did a great job of portraying them, conveying information with economy but still maintaining that heartpounding sense of tension. I haven’t seen this one, but you haven’t made me want to run out and that change. Seems decent, but not great. About what I expected when it was released. I know a few people who defend it as properly great – I got around to watching it because a friend told me it was his favourite film of all time! – but I can’t say I agree. Good stuff Dave! I actually saw this a bit differently. I remember that Oakland A’s team so well and it wasn’t a case of Beane just being set in his ways. He faced a number of obstacles including miniscule payroll restrictions and aging talent that would hurt more than help any chance they had at winning. I saw him as more of a gambler. He went with a formula that he had to completely invest in or it would never work. And of course the risk was his job (and potentially his career) if it didn’t work. I found all of that pretty compelling and I did think the film did a pretty good job with it. Oh, yeah, I appreciate all that, and it’s not necessarily the commitment or totality of the formula that I took issue with. Basically, what I was hoping for was more of a sense of how he got around the obstacles he faced from his colleagues – what we saw was him steamrolling anyone he could, for the most part, but I did appreciate the trickiness in how he got around PSH’s character’s objections. But it felt like it was missing a conversation justifying himself and, as I said, I really would’ve liked someone to explain that the success of a sporting team is generally based on how much money it can make (which is based on audience/interest) and that is rooted in how much the team wins but also its marquee, marketable players. Awesome stuff, bud :). I rather enjoy this flick, so much to be blown away by, especially the performances. The story, from a non-baseball fan perspective, really managed to capture me. Totally get what you mean though when you say that there isn’t a lot cinematically here, but that’s to be expected. Thanks – there’s definitely a lot to like; I can’t really fault the performances nor the photography, and the story is engaging. I just kinda wish there was a little more to it. Haha, I would’ve loved a film like this about cricket; that’s one sport where I find the statistics absolutely fascinating (the cricket movies I’ve seen – eg the telemovie Bodyline with Hugo Weaving – haven’t done much for me though). This one did keep me engaged despite not having any interest in baseball, though.